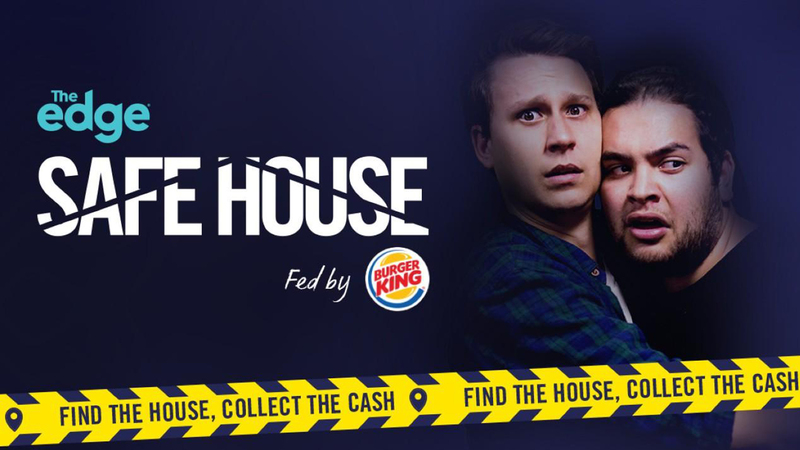 In 2018 The Edge was super excited to launch a fresh campaign with "The Safe House", fed by Burger King. The idea seemed simple enough, our Edge announcers would be kidnapped and whisked away to the Safe House’s secret location, which would be their home until a listener could Sherlock their way through clues and knock on the door to win $5000. Throughout the four-week campaign Burger King was integrated into the Edge Safe House through on-air, online, TV and social platforms. Guy and Sam from The Edge Workday were the first hostages. Four times a day they were issued a new challenge from their kidnappers as well as a new location clue for the listeners. The boys aced the challenge. The Edge created a mini-site for the campaign featuring the Burger King logo and imagery throughout. BK also used its online exposure to deliver a series of partner posts throughout the duration of the campaign to increase brand awareness. With the campaign in full swing the numbers were sky-rocketing and Burger King started to see incredible results. With 332 posts on social media both Burger King and The Edge received some impressive engagement numbers from an impression of over 3 million. “I definitely was a bit nervous but in order to do something bold and fun and engaging you should have a level of anxiety attached to that. The guys at The Edge are known for creating mayhem but when you’re in the middle of it, it’s professional mayhem – they know what they’re doing.